The Blue Basin Overlook Trail is one of the most colorful spots in Central Oregon. Seriously. It’s blue. 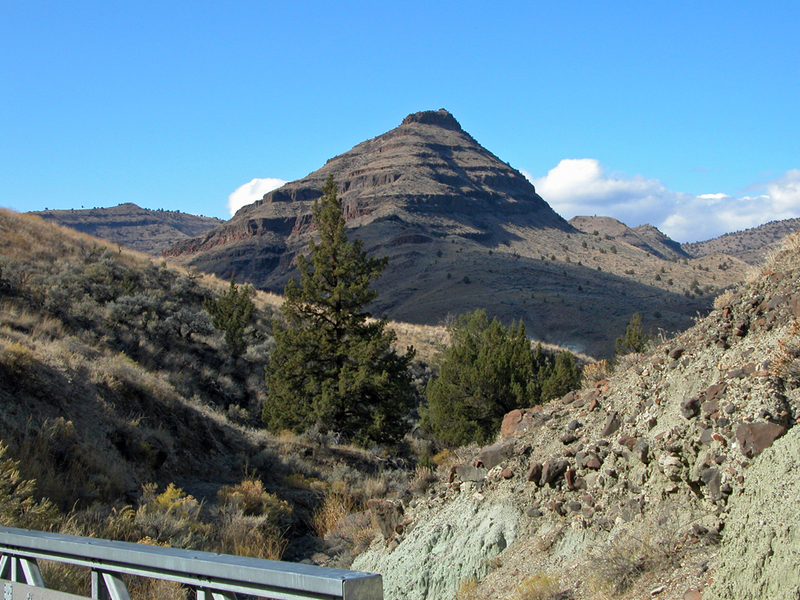 Managed by the National Park Service, Blue Basin Overlook Trail is part of the John Day Fossil Beds – Sheep Rock Unit. This 3-mile loop trail is strenuous in spots, hot in the summer and beautiful to behold. Dogs are meant to be kept on leashes for this hike, and packing water and a poop bag is recommended. There are actually two trails you can take at Blue Basin. A short 1-mile trek takes you to the interior of this iconic natural formation (Island in Time) and is totally worth the time to visit. The Overlook Trail hike is mandatory for soaking up the scenery, taking advantage of the many photo ops and for getting a workout. We usually take the trail as it leads to the left out of the parking lot which approaches the actual basin from the backside. The climb will take your breath away, as will the views. The landscape surrounding the basin is quite beautiful and the higher in elevation you go, the more colorful the vista becomes. Painted hills of banded rust colored earth as well at swatches of layered blues and green dot the hills and valleys all around this area. There are a couple of benches strategically placed along the trail to allow hikers to catch their breath, and for taking in the view. And, this is one trail that is best experienced with some quiet bench time to soak in the amazing views. As you crest the top of the hill the basin opens up below revealing an other-worldly landscape like nothing else you’ve ever seen. Depending on the time of day and how recently it’s rained (for taking photos I recommend going after a rainstorm, and in early morning or late afternoon) the tones and textures will run from pale green to deep aqua, dark green and rust. 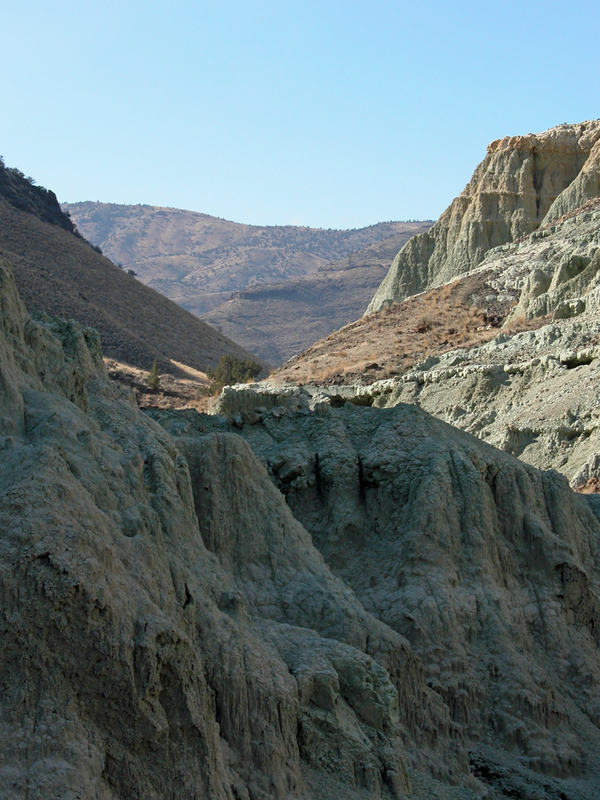 According to the geology experts, the blue deposits in the basin and surrounding area is actually volcanic ash that has turned to claystone which has eroded over eons of time. It is brought to its characteristically brilliant color with the help of minerals that have leached into the soil. There is also a rich variety of vertebrate fossils found here and preserved at the Interpretive Center. 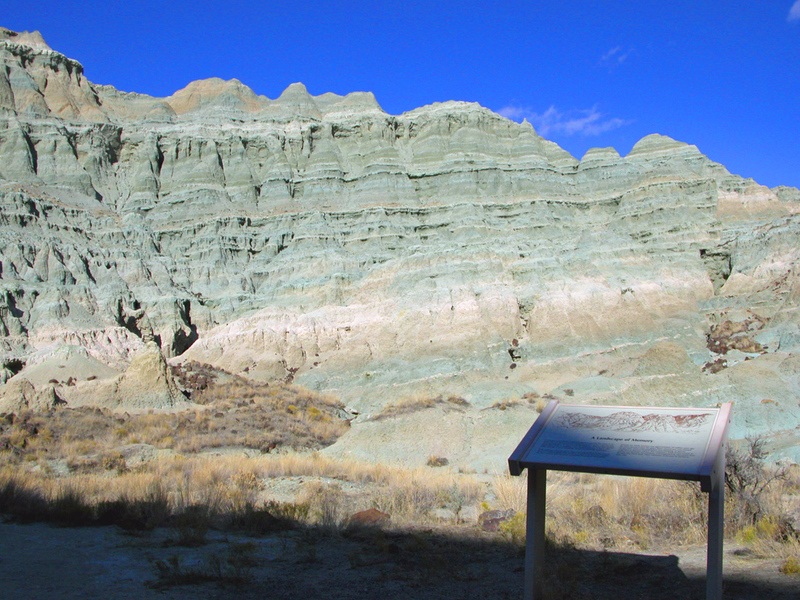 Fossil replicas can be found along the 1-mile interior trail and are interesting to learn about along the way. What you’ll see: Blue Basin is a haven for a number of bird species including birds of prey, and early in the spring you will catch the bloom of a variety of magnificent flowering plants. Depending on the day of the week and the time of year there will be a few hikers (fewest taking the overlook trail), a few hiking dogs, occasional Park Rangers, and frequent parking lot picnickers. This is a lovely description of the Blue Basin Overlook Trail. I hiked this trail long ago, and am currently writing about it in my next book, Vagabonda. If you are interested in reading about camping adventures, please check out my first book, The Route from Cultus Lake: A Woman’s Path to a Solo Camping Lifestyle.